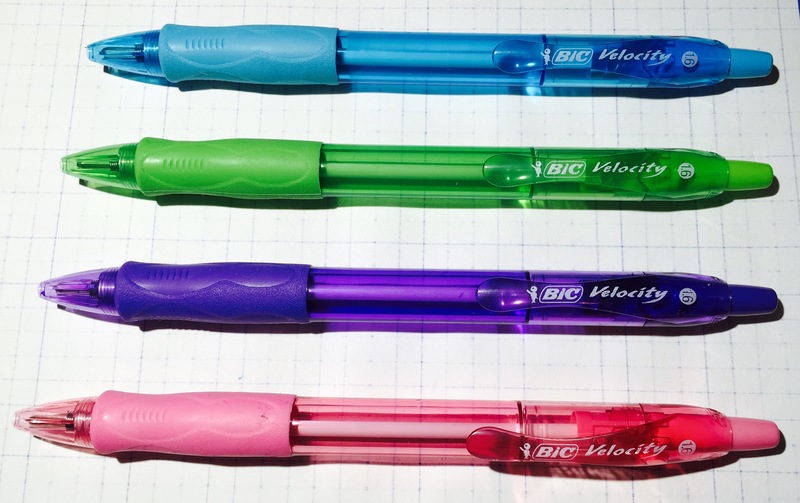 At 1.6mm, these BIC Velocity ballpoint pens are terrible for writing, but their colors make them all right for drawing. For ballpoint pens, which tend not to have the greatest-looking colors, the pink stands out quite nicely, and the purple takes a good dark note. The green and blue are bright, but they seem to come out a lighter on the page. Just like the Velocity Gel pen, the clip feels pretty flimsy, and I’m not a fan of the way the grip flares out near the tip. However, they are still relatively comfortable to hold. There is plenty of blobbing up with the ink, so be prepared for some smearing, but the ink flow is both smooth and consistent. 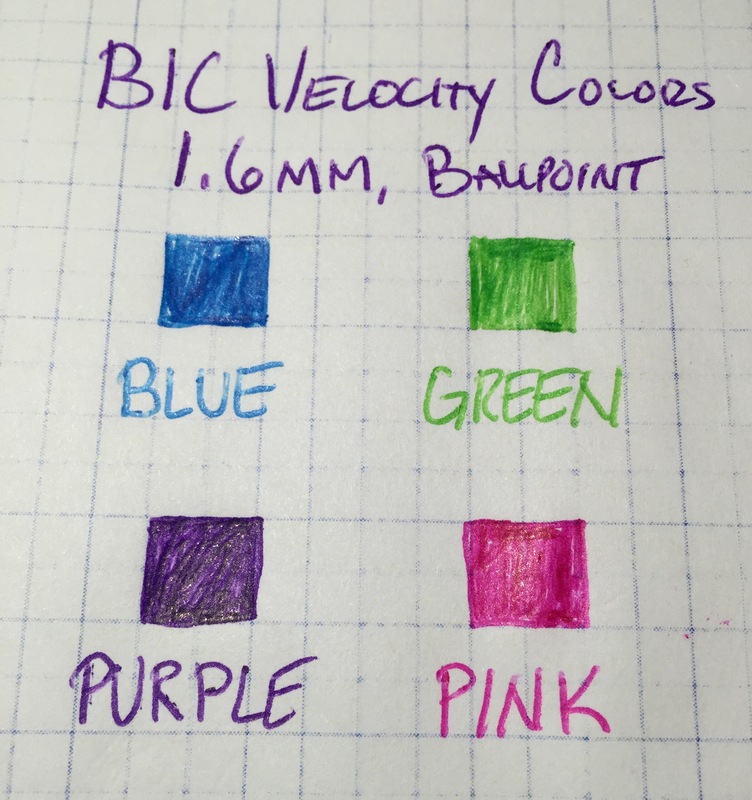 Because of the thick 1.6mm line and the blobby ink, I can’t imagine artists enjoying these Velocity colors. On the other hand, this seems more like a set of colored pens to give to kids. Keep in mind, however, you may need to replace them soon because these pens don’t have a very large ink cartridge. P.S. 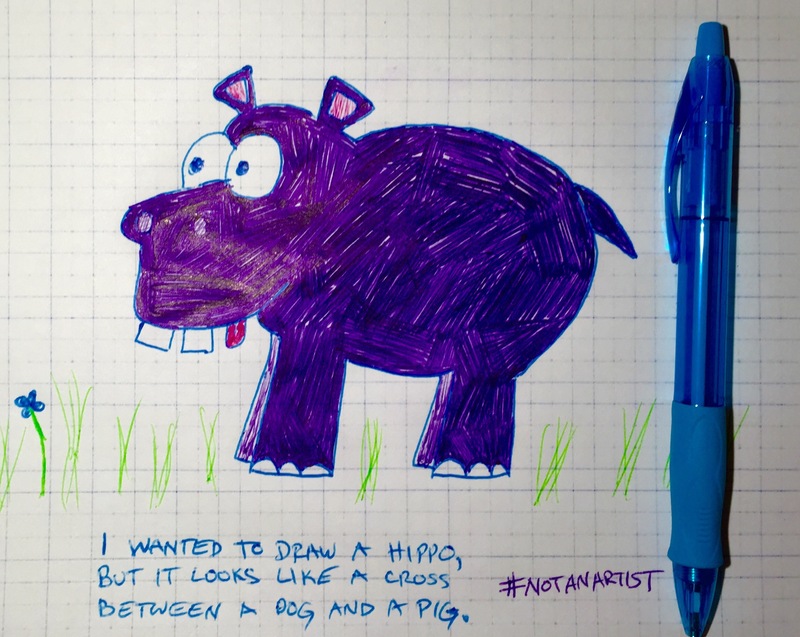 My apologies to How-To-Draw-Funny-Cartoons.com for butchering this hippo. And, yes, it is supposed to be a hippo. I bought a set of these at Dollar Tree. A 2 pack of black Bic Velocity was a steal for a buck. They aren’t my “favorite”, but I don’t mind them for stashing in book bags and purses. I like your colors– you’re right, they’re very bright! Not a bad deal. I think I might have paid a little more. And agreed… not my favorite, but they’re fine for basic uses. Use them all the time. My favorite pen.